After finishing the SuperCables CookBook by Allen Wright I decided to make some audio cables. One of the concepts that Allen pushes in the book is very thin wires. Originally I had no intentions of making any cables from the book but after reading through the book I got the urge. According to Allen thin is in. I chose to try a couple of the designs that use wire wrap wire (WWW). Details of the cables that were built using WWW are noted in Part 2 of the SuperCables CookBook review. 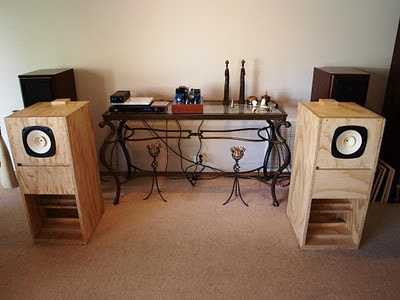 The test set-up used to evaluate the cables consisted of an upgraded Oppo 980H, a diy build of the Nelson Pass B1 buffer preamp, a diy 6AS7 SET power amplifier and Fostex FE206En drivers in a back loaded horn enclosure. I selected a number of test tracks which I thought had enough variation to exhibit any great cable sonics. To make sure I was not biased I enlisted the aid of a golden eared friend, Ron from the Melbourne Audio Club. He also brought along his test tracks. We played through about half a dozen test tracks using both short and long runs of #1, Air-spaced Finewire RCA cables and set of #6, Air-spaced Finewire speaker cables which were 2 m in length. My SET amp produces only 3W so fine wire speaker cables will work with this amp. But will it be the best sound we can get? Of course this in no way covers every tone or nuance of every sonic effect listenable on any recording but I feel it was enough to highlight the main differences in the cables. After listening with the cable combination above we swapped the #1, Air-spaced Finewire RCA cables for a cheap $2 store bought RCA cable. Some areas of the test music actually improved. The sound stage appeared to widen or was it just smeared between the speakers. The violin appeared to fatten-up or was the detail just lost. Ron and I then, cable by cable, started putting back both sets of #1, Air-spaced Finewire RCA cables and the other various cables that we had on hand. We started with the short #1, Air-spaced Finewire RCA cables which lead from the CD player to the preamplifier. We also introduced my twisted version of the WWW interconnect cables and also my braided Silver Highway RCA cables. I have built many sets of these high-purity silver wire RCA cables and everyone who has used them claims they are excellent. At each stage we re-listened to the three test tracks. Without boring the pants off you with every detailed cable swap this is what we found. My diy Silver Highway RCA cables (900 mm) worked best between the preamplifier and power amplifier. They worked better than my twisted WWW cable, but only slightly better. Multi-stand heavy OFC speaker leads (3 m long) with heavy brass banana plugs only just outperformed the #6, Air-spaced Finewire speaker cables (2 m long). Note: The twisted cables comprise of three wire wrap wires, only two of which are terminated at the destination end. I believe the 30 pF of capacitance for some of #1, Air-spaced Finewire cables is due to the cheap RCA plug that was used. The twisted cables had only 13 pF for the destination end which only has two wires connected. Also the RCA used on the twisted cable were heavy weight high-end types and I believe low capacitance types. It is worth while trying different cables, weather you make your own or buy them off the shelf. If possible, try borrowing some friend’s cables before outlaying hundreds of dollars on expensive ones. Different combinations of cables can work better than just one cable type used throughout your system. If nothing else, cable swapping and comparison will fill in an afternoon and you may enjoy the music along the way. This concludes Mark’s three part series of the SuperCables CookBook. For the full story, refer to the SuperCables CookBook (Part 1) which reviews the book and Part 2 of the SuperCables CookBook review which takes a look at a couple of the cable recipes.